Congratulations! Will drop you an email to get your details. 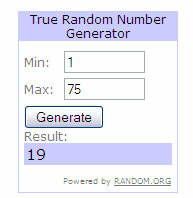 I used random.org to chose the winner by the way…. Thank you so much to everyone who entered, I was so pleased with the response and loved reading about all your favorite beauty products. I will probably do a post soon about what came out on top as the most popular. Also, I will be doing another giveaway soon as I am now already close to 400, so going to probably do another when I hit the big 5-0-0! In the meantime, please do keep reading – let me know if there is anything you would like to see/read about on here.